Fun and thrills are the order of the day at Seoul's main theme park, drawing about six million annual visitors. 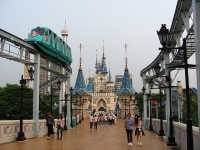 According to the Guinness Book of World Records, Lotte World is the largest indoor theme park in the world. The park is divided into an indoor and outdoor section. Inside, Adventure Land covers acres of streets representing different countries filled with hundreds of activities, entertainment activities, shops, restaurants, and ongoing parades. Outdoors, Magic Island offers thrilling high-altitude rides, laser shows, and pleasant walking trails around a lake, all set in the shadow of a fairytale castle. There is also an indoor ice rink and a fascinating Folk Museum, complete with miniature villages. Opening times: Operating hours are 9.30am to 10pm.